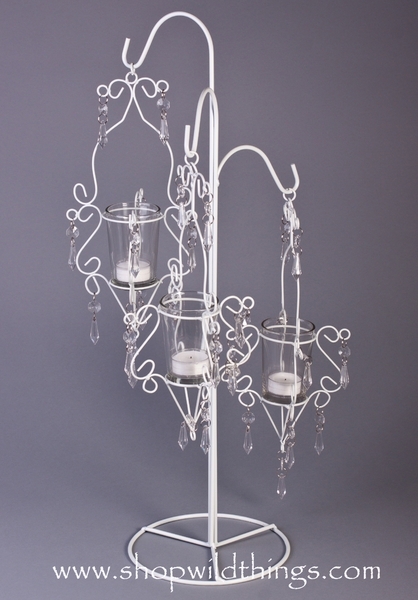 Our pretty "Jacqueline" metal 3 candle holder will just delight you and your guests! This is a super inexpensive candle holder that�s covered in pretty swirls and acrylic crystals hanging from them. The glass candle cups are 3.5" tall and 2" wide, so you can use votive candles, tea light candles, or short pillar candles! Use as shown or add some floral Decor easily using the swirls to hold everything in place. You might even consider adding some of our LED votive candles which are available in many colors. This candle holder is 24" tall and 13" wide. To change the look for different events just by removing the candle holders and using the stand and hooks alone. We love pieces that can be used for many looks, stretching your decorating dollars. This is a nice piece for a centerpiece. Good quality and great price! Order a large quantity and had a couple of broken candle holders break during shipment. Called and got immediate response and replacement. The staff was apologetic and the replacements arrived in a couple of days.